I'm surprised to see both ‹e› and ‹ʔ› in the same transcription choice. I'm baffled whether the transcription is phonemic or phonetic. Or a little bit of both. And what accent is ˈdeʔfəd? Something similar could be said for ˈklæʔm̩ : why ‹æ›? This blog must be riddled with people who are sometimes not entirely sure of how to pronounce a certain sound so illustrating it with a pronunciation of a familiar word, or one they can easily imagine, would blow much of the cobwebs away. But then again, I now everything you write is very carefully thought out and very precise. So there must be a reason. It's the symbol set I/we use in classroom work: here. Glottal stop symbol present by popular demand. John has told us more about his use of transcription for different purposes and different accents than ay phonetician I know of. A careful reading of Accents of English and the introduction to the LPD should resolve most of the puzzles you find. When John means phonetic transcription he shows it. And it's the same with phonemic transcription. Most of us have no difficulty in interpreting the deliberate absence of distinguishing / /~[ ]. David, hmmm, I wonder what passages exactly in the Accents of English you mean. In the LPD it can be nothing else but the preface, which the publisher wanted as short as possible. Which created difficulties. J.M.R. asks "And what accent is ˈdeʔfəd" ? For me, who was born in South-East London (although I do not have a S. E. London accent : my mother went to great pains to ensure this), ˈdeʔfəd" sounds completely authentic. Two syllables with quite distinct vowel sounds, separated by a glottal stop. I was actually going for [ɛ] vs. [e]. I did wonder if that was the point. As far as I can tell (and I am not a linguist by profession), John uses e rather than ɛ because he is presenting a broad (phonemic) rather than a narrow (phonetic) transcription, but others far better qualified than I should ideally comment on whether that is a correct observation in this context. For those who care exercised about John's use of e and ɛ (which I'm most decidedly not), the relevant statement woulds seem to be on p 128 of Accents of English 1. Could you possibly repeat that statement here, David, for those who lack the benefit of non-library access to a copy ? John uses e for the RP vowel in the DRESS lexical set and ɛ for the General American vowel in the same set. I don't know of any definition of phoneme which would recognise the two sounds as phonemically distinct. In a way, John is taking us back to an older age when transcription was relatively broad and relatively narrow. For me, John's use signals an interesting phonetic but not phonemic difference between two accents. Again, he's taking us back to an early age when what mattered in a language were differences (the 'structuralist' age). I don't know if this is what John actually means, but I interpret him to be using contrasting symbols to signal interesting systematic differences at any level. When he chooses to operate at exclusively the phonemic level, he uses slashes like the rest of us. When operating at the exclusively phonetic level, he uses square brackets. Generally on this website he uses bold type without either form of parenthesis. I believe one or more phoneticians are questioning John's perception of that difference. But there is no doubt that he means what he writes. It seems you perhaps were closer to John's thinking than I was. His use of slashes would seem to indicate that the two sounds are indeed two phonemes albeit one in one system and the other in the other. For John's purposes RP and GenAm do not share a phonology, well not entirely. • Go to the Amazon page for AofE 1. • On the left hand side, under Search Inside This Book, type 'vocoid"
It's funny, but in the spirit of your post above, I'd say the other way 'round would have been right(er). Is the American DRESS not higher/less open than the RP 'un? So it would seem to me... Am I terribly wrong? One criticises our venerable host with all due trepidation, yet still... amicus Plato... . I'd say ɛ would've been right(er) for the American TRAP, even, sometimes accompanied with a schwa, 'man' [mɛ-schwa-n], I seem to have heard in the US. Keep returning to that listen once more site. As well as making some cosmetic changes, John has prepared it to include an American speaker and his comment. Meanwhile, the woman in the RP sound file shows just what John means by RP. Sorry, I am clearly not intelligent enough today. Is it from the listen once more site self-evident that John is right in his choice of the symbols at issue ('e' for RP, 'ɛ' for GA, both for DRESS) and my feeling misguides me completely? Just say 'yes' and I shall persevere in my hard work to make it as self-evident to me. If you want to check John's assertion, you need to hear examples of DRESS vowels in RP as he understands it— which is already possible on the web page— and GenAm as he understands it — which will be possible soon. Other phoneticians may have slightly different ideas of what constitutes a typical RP speaker and a typical GenAm speaker. John evidently put some though into his choice of speakers, so I assume the two speakers contrasted will reflect what he means by his choice of symbols. Personally, I don't much care. All I really want to know is that a vowel is or isn't a DRESS vowel. But I'm not a phonetician. Ah, OK, I've got it. Well, I shall persevere. I wonder if we are failing to see the wood for the trees. John's original response to the very first question seems to clarify the issue -- "It's the symbol set I/we use in classroom work: here. Glottal stop symbol present by popular demand." This is the standard set of phonemic symbols for English (RP and similar accents)." (my emphasis). I feel reasonably certain that the latter adjective ("phonemic") is what is actually meant, but wonder why the heading above refers to "Phonetic symbols". Is it the case that "phonemic symbols" are a subset of "phonetic symbols", in which case the apparent conflict does not exist ? and (2) the sound represented by those phonemic symbols that occur only in combination with a modifier (e.g., length marker) or another symbol : those that seem never to occur alone include a (only as aɪ, aʊ), ɜ (ɜː) and ɑ (ɑː) -- are there no sounds in RP that correspond to the sound of the unaugmented versions of these symbols ? yeah, this puzzles me too. I think the real evil is not, however, that people like you and I are flummoxed but that this confusion contributes to the mistaken general popular feeling that various -emics and -etics, allegedly carefully to be distinguished, are basically 'the same fin'. The point (which phonetic/emic symbol to use for the DRESS vowel) is, ultimately, of little importance, methinks. Maybe only at the stage where you start making distinctions like: one symbol for one English, another for another (like RP and GA, e.g.). First there was an analogue age. The original IPA symbols were used in a sliding scale from very broad (giving minimal phonetic information) to very narrow (giving all the information the transcriber could detect). Then there was a digital age. Phoneticians of (I think) the Prague school hit on a optimum number of symbols corresponding to the number of phonological distinctions in a language. These were the phonemes; any narrower transcription served to identify allophones, or variants of allophones. The two latter were conflated as phonetic so transcription became a binary matter: phonemic or phonetic. This binary system is a reasonable idealisation for many purposes. For language teachers a phonemic transcription is generally ideal — although it needs to be supported by a good deal of phonetic information. If you stick to one accent in the target language, you can get by on a small set of pleasantly familiar symbols. This link which John gives below explains the pre-1962 'more Jonesian' system which used to served very nicely thank you for EFL teachers aiming vaguely at RP. But phoneticians wanted their phoneme symbols to be closer to their phonetic value. Hence the historical process described by Geoff Lindsey in that link. Moreover, the dictionaries and other works consulted by teachers started including transcriptions of American pronunciation along with RP. So any non-phonetician interested in English pronunciation needs to understand the symbols for (at least) two largely similar but partly different phoneme systems. John, quite reasonably in my view, has devised two different phoneme-symbol sets for the vowels of the two accents. It reminds us of the differences when reading about the two accents. For different purposes, it might be easier to work with a single set of phoneme symbols, each one interpretable as the sound of the phoneme in RP or the phoneme in GenAm. Phoneticians may not like that. Fortunately, John has given us the blessed gift of LEXICAL SETS. Without the muddle of copious symbols — nay, without any exotic symbols at all — these allows us to speak and think about the vowel phonemes of English as a whole. Then, once we're clear what we're talking about, we can consider the typical phonetic value of each vowel phoneme in a particular accent. So if forced to think in strict binary terms, these transcriptions that John uses are both phonemic and phonetic. As transcriptions of individual accents, they're phonemic. But as transcriptions of English, they're selectively phonetic — identifying what may be thought of as accent-specific allophones. Some phoneticians seem to be carrying the process started (sort-of) in 1962 to extremes. They hanker after a system whereby the symbol for each phoneme is narrow in the old sense — as close as possible to the nearest applicable IPA symbol, leaving only the minimum of phonetic information to be supplied by general background description. I can see the value of this for comparative studies study, but it seems far too much trouble for non-phoneticians like us. By all means supply every possible refinement in the transcription of allophones and variant pronunciations, but stick inside square brackets and think of it as different from phonemic. Another problem which I personally feel is that phonetics and phonology have parted company. From a phonological point of view, the phonetic value of a phoneme is almost irrelevant, provided that there are the right number of them, commensurate to the number of possible contrasts in a language. A phoneme is so abstract that all a phonetician is required to do is to compile an inventory, and then devise a set of rules for converting those abstractions into concrete speech sounds. That is very bad news for language teaching, ain't? There should be a language with model sounds, like there is in fact for some sounds, as when say 'a' like in Italian or Spanish, or some such. Lexical sets are a great thing, I agree, but we need to know how to actually pronounce (produce vocally) all those various dresses, traps, struts and what not... In and by themselves they are sufficient only for those who are accoustically immersed in the English tongue, its phonetic element, anyway... otherwise they are algebraic unknowns in a system of too many equations. This does not detract from John's greatness, of course. Open/close symbol for DRESS has been discussed many times and from what I've seen it's usually the American visitors here who complain. It's probably one of those things like people not understanding the i and i symbols. What I wanted to know in the accent of South London, is the vowel open or close? Would it be feasible, I wonder, to replicate John's lexical sets in one or more other languages (not for those languages : for use in discussion of the English language, but by native speakers of the language into which the sets have been replicated). Is it even possible : are there any natural languages that contain a superset of the vowel sounds of English ? J.M.R. asks "in the accent of South London, is the vowel open or close ?" I lack the phonetic training necessary to answer that. All I can say is that by using the Wikipedia audio IPA chart (is there a better resource I should use ?) 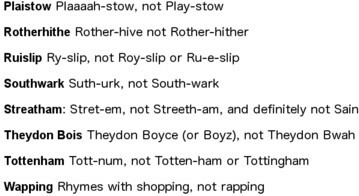 as reference, I would say that the South London "e" in Deptford is mid -- the "mid e̞" is very close to my mind's ear's version of the first vowel of South London "Deptford". That is very bad news for language teaching, ain't? I don't see why. Phonology tells you that something is worth teaching. Phonetics helps you work out how to teach it. Of course, other things may tell you that something is worth teaching. What phonology tells you is whether a pronunciation error is a potential barier to understanding. For example, approximately authentic articulation of most English consonants is 'good enough' most of the time. If a learner gets the aspiration of a plosive wrong, or substitutes 'clear' for 'dark ' L, he or she will be understood. But woe betide the Japanese learner who doesn't get /l/ or /r/ pretty close to English target sounds. There should be a language with model sounds, like there is in fact for some sounds, as when say 'a' like in Italian or Spanish, or some such. I've seen it suggested that the original cardinal vowels of the IPA bore a suggestive similarity to the values of those letters in the spelling of French. I think like in Italian or Spanish can be a mixed blessing. As a reminder not to pronounce a word with an English æ sound, for example, it can be very useful. The down side is the danger that the learner will try to pronounce it exactly like Italian or whatever. I think the straight answer is 'No', Phillip. The whole point of the composition of those sets is that they are collections of English words which are pronounced with the same vowel sound in a given accent — and also in another accent, even if the vowel sound is different in the two accents. The nearest project I can think of is to compile sets of international words. We could have a PSYCH set, for example, with values i in French, aɪ, y in German etc. However, this would be far from an exhaustive inventory of sets. And a set like this would be of severely limited use, since it would contain only a fraction of the words with i in French or aɪ in English or y in German etc. why bad news? Because -logy has become terribly abstract and algebraic, whereas -etics --- very scientific and such as to make it difficult for a non-PRAAT(etc)-minded language learner to draw any morals from it. you meant: woe betideth or will inescapably, inavoidably betide? Not just '(may) betide', right? Re cardinal vowels in French, yes. But. But it was like 100 years ago that the Fr. vowels were cardinal, now no longer (perfectly), f. inst. the difference between the front and the back 'a' is close to collapsing, in Fr., and also the open variant of 'o' gets somehow fronted and perhaps a little de-labialised, this is my impression at least, it sounds like a quaint variant of STRUT to my ears, a lot different than LOT in English. Re 'a' in English and Italian --- so you don't seem to share Geoff Lindsay's feeling that they are now (virtually) identical (so that only trying to pronounce it, in English, EXACTLY like in Italian would bring any difference to the fore)? I see that a Japanese learner is not at all likely to confound the English /l/ and /r/, like saying 'berry' for 'belly'. It's not that they confound the sounds. The problem comes when they try to produce the one or the other. They may not be confused, but unless they make a reasonable approximation to the target, then their hearers may be confused. Phonology makes clear to the teacher that these two sounds constitute a special case. Pronunciations which miss the target for most English consonants don't sound like allophones of a different phoneme. The danger in this instance is that the japanese speaker will be misunderstood or mocked or both. Re Japanese learners, I thought that since the Japanese /r/ is quite unlike the common English, though not Scottish, /r/ no confusion on either side is likely. Rather, with /l/ and the intervocalic /t/ in Am.E., so the Japanese is likely to be heard as saying 'Betty' while what he is trying to say is 'belly', see what I mean? But that would work---if this be the word---only in the USA or CAN... wrong? Is there a current vowel chart for French or is http://venus.unive.it/canipa/pdf/Voyelles_nasales_franc111.pdf true? At least another canepari-diagram confirms my intuitions concerning the centralisedness of the open /o/ in French. If you see a W in the middle of a place name, just ignore it (hence Gren-itch, suth-urk, Wool-itch and Chis-ick). In Yorkshire we have, within a few miles of one another, Dodworth and Cudworth, which have no [w], and Hemsworth and Ackworth, which each have a [w]. God knows why this situation developed. So what should the RP speakers do: says ˈdɒd wəθ or ˈdɒd əθ? These places are old pit villages. I'm aware that there are some places where there is sociolinguistic variation as to whether the [w] is pronounced (e.g. Darwen in Lancashire). However, these places are probably too small and homogeneous for that. I can't imagine that there are any RP speakers in Dodworth. Yes, but what if there is some sort of plague or 180 feet of snow in Dodworth or Cudworth and the BBC has to send in a reporter, they have to pronounce it somehow, don't they? I would recommend ˈdɒdəθ. Including a w just seems like an outsiders' spelling pronunciation, much like it would in "Chiswick". The BBC tries to respect local pronunciations for place names, so it would probably say ˈdɒdəθ. Which is a double-edged sword: thankfully, Dodworth à la BBC isn't all that much different from Dodworth locally, but look at what happened when I said use ˈsɪsɪtə. Actually, I'm on the side of Londonist. The purpose of the lists is not to specify exactly what pronunciations to use, but to alert readers as to what spelling pronunciations are to be avoided. What I find surprising that inhabitants of (the environs of) London need such explanations in the first place. Also, that someone should be tempted to read 'wych' 'wick'. Also, that the -ham component of 'Clapham' should obviously not be transparent to some. How 'woolworth', the famous chain-store for the poor? Woolurth, too? Hm... I've only heard about Woolworths, with an s, the Australian company, and Woolworths, “Woolies”, but that used to be a high-street chain. There is the Walworth Road in London, ˈwɔːl wɜːθ, but that, I presume, is another matter. I'm not sure this is meant for the Londoners, but rather for the visitors. I don't know. But certainly it was an American company to begin with, and certainly Americans pronounce both instances of /w/ in the name. Then there is the question of which witch is which. Greenwich means “green trading settlement or harbour”. Aldwych is “the old trading place”. And Dulwich is “marshy meadow where dill grows”. The names Greenwich and Aldwych come from wīc and Dulwich from wisc. Is that the same? Lovely! But this custom has died out, hasn't it? How about Suthworth or some such, I forget --- with or without a 'w'? John Sudworth, the BBC correspondent from South Korea, is ˈsʌd wəθ. There is the Southwark Crown Court, the place of a recent marital soap opera / drama splashed across the news bulletins and newspaper cover pages. The May Queen custom? I don't know about Walworth Road parade, but it does exist in Canada. There is now: the tallest building in the EU. And, in fact, there was always this. My hosts dissuaded me from seeing Aldgate too, on the ground that there was nothing remarkable there... Within Aldgate Chaucer, as the legend has it, sat (stood?) and wrote all that... . Well, obviously in his times there _was_ a whole lot of things worth seeing in London and thereabouts... I hope at least the pronunciation of 'Aldgate' is regular, is it not? My east-ender father used to say of his east-ender father that he always professed to be 'lost anywhere west of Aldgate Pump'. When telling this story, Aldgate would always be pronounced ˈɔːlgɪʔ. Re 'wych', Ok, fine, but the '-k' pronunciation would be sort of learne`d, Latinate, extremely unlikely to be the right one of an Englisc locality name. The States are a different thing, they have things Dutch over there, e.g. 'Schenectady', originally [sx-] (Dutch). Customs die out, but customs are revived. Indeed, all British seasonal ritual customs are revivals, since even those with the longest unbroken tradition must have been revivals in 1660. That's when Charles II and the monarchy were restored, prompting people to revive what they chose to remember of customs celebrated before the Puritans killed them off. Some revivals are attempts to recreate what was performed in the locality and has persisted in living memory or in descriptions by folklorists. Some are a matter of guesswork, even pure invention. Some are copied from other people's customs. The motivation for the revival may be mere enthusiasm or the desire to foster 'community spirit' or simply to create a tourist attraction. And the motivation may be a mixture of any or all of these. When we first came to Edinburgh, it was still the custom at Hogmanay (New Year) for people to gather outside a particular large church, where they would drink a great deal and greet a lot of complete strangers at midnight. Since then, Hogmany has been turned into a suite of celebrations which generate revenue and tourism. One of these is a Torchlight Procession, basically copied from the traditional Shetland Up Helly Aa. A typical May 1st revival included a May Queen procession similar to the one in the film and some maypole dancing. Almost without exception, these are Italian dances taught about a century ago to young women training to be primary school teachers. An English maypole was huge — much, much taller than revived maypoles. A recent TV play based its plot on a combination of revived and invented customs. It started with the May Queen being murdered and it slipped in various dark superstitions and sinister customs. The sinister custom device worked very well when Terry Pratchett invented Black Morris Dancing in Wintersmith. But Terry wisely placed the Black Morris Dancing at the opposite end of the year to Morris Dancing proper. For me, the incoherence in the customs of the TV play village quite spoiled the play, even though It was beautifully acted and directed. As for Walworth Road, I don't think people feel it as a distinct community any more. this Google hit recommend only events near Walworth Road, none of which include a May Queen. I wonder whether the old ceremony was dreamed up by the personnel of Walworth Road Railway Station. I have a friend who is involved in a May Queen movement in and around South London. I wasn't aware of it until I had a conversation with her a couple of years ago, and she described how the whole thing was organized, with various local May Queen organizations choosing their own May Queens and then the whole thing culminating in the choice of an overall May Queen, and also girls spending several years working their way up through the hierarchy until they were eligible to be chosen as May Queen. The culminating event occurs on Hayes Common in Bromley, and I see this is referred to in Wikipedia. where did they, I can't help wondering, take those LOTS of strangers at midnight from??? Were these strangers sent appositely from somewhere else with busses? And were the greetings fair-to-middling friendly? Here is an illustration of the custom — except that the crowd is implausibly orderly. Edinburgh is not a large city. People walked to the Tron Church beforehand and walked (or staggered) home afterwards. The Scottish New Year greeting is sincere and uncomplicated: a handshake and the words Happy New Year. This greeting is exchanged annually between fiends meeting for the first time that year — even if it's long past January 1st. And in the early hours of Jan 1st, we shout a greeting to anyone we pass in the streets. The Tron celebrations were pretty rowdy — attended by people without family celebrations to go to, and with a tolerance for public drunkenness. And here is a zoomed version. Thank you. I am for a' that and a' that deeply ignorant of Scottish life, and sal for ay sae remain, I fear. What denomination is the church? Presbyterian? I used to be impressed by McDiarmid's Hymns to Lenin, I mean by their boundless good-naturedness and naivity, but that is no royal road to things Scotch, I tak it. The Tron Church is no longer a church. Like all old Scottish churches, it was originally Catholic, and then became Church of Scotland. Anglican, Catholic and other Protestant churches are all relatively modern buildings. Reverting to May Day, this page gives a nice illustration of modern practices based on tradition, and of the historical background. Do read the extract from the Puritan tract attacking May Day customs. The name 'Southworth' (person name)---how, if at all, ought it to be pronounced? Suththurth? These local names are very interesting, because they allow sensitive probing along the boundary between accent differences and (minor) dialect differences. Presumably, if I will be understood if I say /plæstoʊ/ (hardly /plæstəʊ/), then I will be equally understood if I say /sʌðɚk/, though doubtless no local has said this rhotically for centuries. What about /wɑpɪŋ/ and /rɑðɚhaɪð/? Surely the second dental fricative can't really cause a problem, but how about the LOT=PALM equivalence? And what of Borough? 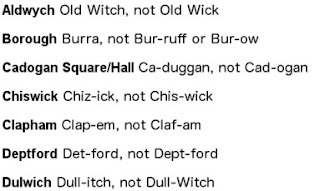 My version of borough does not have vowel reduction: must I say /bɚ.ə/ rather than /bɚ.oʊ/ for the place name? I suppose I won't know till I go to London and try these pronunciations out on people, which is precisely where the probing comes in. By the way, is the first consonant of Theydon really /ð/ rather than /θ/? P. S. Why sometimes yes to the length mark and sometimes no? As I indicate above, Theydon has θ. Only function words have initial ð in English. J.M.R. : In my kind of AmE, at least, the LOT=PALM vowel is definitely back and unrounded, as distinct from the starting points of MOUTH and PRICE, which are centered and unrounded. It is now conventional to use both quality and quantity indications in RP, although technically each is redundant to the the other; but since AmE uses a variant of the Scottish Vowel Length Rule to determine quantity, there is little point in marking it there. J.W. : Sorry, I mixed up your transcription of Theydon with the Londonist's. But isn't ‹a› “better” given the starting points of PRICE or, better, MOUTH? OK, this may be beside the point, but I've never heard an American (except for newsreaders and narrators, people with speech training) for whom MOUTH and PRICE, begin at the same position--centered or not. Typically MOUTH has a fronted [a] and PRICE has a backed [ɑ], same as MOST other places in the Anglosphere (the degree of fronting and backing of course is relative, and definitely less extreme than, say Southern England or Australia); the Inland North is an exception, though, with a backed MOUTH and fronted PRICE, which still supports my point. Hi Mr Basu, as an extreme layman I'd should like (be allowed) to throw in that to my ears the starting point of the American PRICE or EYE is rather central, and not at all backed, the backed [ɑ] for't I can't help identifying as England's English. But then I very seldom hear the latter... Yet the accoustic impression persists. Now, in 'now' or 'mouth' the starting point in some variants of AmE (Southern?) is fronted and perhaps a li'l raised, so as to sound a bit like England's English's TRAP, but that's a different story. You certainly hear various Englishes more often than I do (I have hardly heard any for years). And as for what Wojciech is saying, Gimson in 1962 chose rightly aɪ for PRICE and ɑʊ for MOUTH, but then John Wells got rid of it and chose the same symbol for the starting point. But then again a mess ensues because depending on where you look one wonders which witch is which. Did educated people, or posh people, or posh and educated people, back in the days had a fronted starting point in PRICE, but back in mouth? Or was it vice-versa? What does Daniel Jones say? Is he right or is Cruttenden right when he says the diphthong in question in Refined RP is [ɑɪ], which often eliminates the glide and becomes somewhat more front than PALM? Cruttenden invented a whole lot of sounds including the most peculiar of all, the [ɐɪ] for ɔɪ. All of us are "right". Instead of quoting authorities, why don't you just listen? Note how my own PRICE vowel (and Jones's) has a much fronter starting point than David Cameron's. During the century since DJ wrote and during the half-century since Gimson wrote, even during the third of a century (almost) since I wrote Accents of English, the language has changed/developed. And not even Cruttenden has "invented" any sounds. For a serious attempt to get to grips with this, see Geoff Lindsey's blog. You are absolutely right when you say that AmE PRICE has a central starting point in a lot of accents, and MOUTH ranges from being central to fronted (and even raised, as you say). But I have heard a lot of (North) Americans actually backing PRICE; most of them, I assume, are from the West of the country. Now, I can't recommend any sound files, but I can name a person who displays this feature, and he is from the (South) West--Dr. Zeb Hogan, ichthyologist/ecologist, who I've learnt is from Arizona. I do not know western US. Never been there. The farthest ever in the west I have ever been to is I believe Tucson (Arizona? I can't remember) or some place like that. I am looking forward to meeting Dr. Hogan, would love to have a talk on fis(es) with him. Cheers from Gdańsk (where they do not /yet?/ generally speak English, which is why I next to never hear that language, in any accent/version). Note how my own PRICE vowel (and Jones's) has a much fronter starting point than David Cameron's. During the century since DJ wrote and during the half-century since Gimson wrote, even during the third of a century (almost) since I wrote Accents of English, the language has changed/developed. And not even Cruttenden has "invented" any sounds. Thank you! That blog seem fantastic. I must check out your own PRICE and David Cameron's, I haven't paid any attention. However, I still have no idea where Cruttenden found [ɐɪ] for CHOICE, but hasn't managed to find many other, quite frequent and gawping sounds, some of which Geoff Lyndsey mentions. All of us are "right". Instead of quoting authorities, why don't you just listen? I wouldn't dare. What if I'm wrong? Furthermore, English phonology has been in existence for something like 300 years, one would expect phonologists to have completely described the system, in the most minute details. With two quite vigorous w sounds and with secondary stress on worth. Many of us often, if not consistently, said ˈwʊl ̩wɜ:θs or ˈwʊl ̩worθs or ˈwʊl ̩wərθs or something of that order. I South Africa, Woolworth used to be (perhaps still is) a rather upmarket store. It had the appearance of a sort of sanction-busting-laundering front for Marks and Spencer. It was always ˈwʊlwəθ(s) to me (environs of London). ˈwʊl ̩worθs would have sounded decidedly odd. ˈwʊl ̩worθs would have sounded decidedly odd. Not so odd in Scotland, I think. Personally, I do pronounce the first syllable of "Aldwych" like "old". THOUGHT usually becomes LOT before /l/ plus obstruent (except if the /l/ is morpheme final: "calls" and "called" retain THOUGHT) and then LOT merges with GOAT before non-prevocalic /l/. I'm not a Londoner, though (nor even a south-easterner). I suppose the reason they show th-fronting for the second th in "Rotherhithe" is that they can't think of a better way to show haɪð than the one which is already there in the spelling. I might just say "rhymes with scythe". 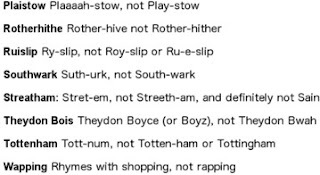 For "Tottenham", is the to-be avoided "Totten-ham" the three-syllable pronunciation ˈtɒtənəm, or is it a stereotypically Amercian pronunciation with a full-vowelled [hɛəm] on the end? I have managed to find ˈmærələbən, -boʊn, ˈmærəbən, ˈmærɪbən, ˈmɑːlɪbən so take your pick. In my childhood they would be merry, in Poland, saying 'Tottenham' the Polish way, [-xam] which turned it to the Pl sentence meaning 'it's that boorish uneducated person, that churl' or some such. For "Tottenham", I presume it is the pronunciation of the final syllable that is the main point. In my head, Tottenham is always three syllables (ˈtɒtənəm or ˈtɒtn̩əm), but I realize it probably often comes out as ˈtɒtnəm. See also this. Marylebone is ˈmærɪləbən for me. Interesting name. Originally Tyburn, this was replaced by Maryb(o)urne when a church of St Mary was erected in the 15th century. The 'r' was dropped within a century, presumably indicating non-rhotic pronunciation in the 16th century? The 'le' was added later (17th century), possibly on the analogy of St Mary-le-Bow in the City. I think I need a translation. 'cham' ([xam]), 'ham' does not exist but if it had existed it would be pronounced the same way, i.e. [xam], means 'a churl', 'a boor', an allusion to one of Noah's sons. Listening to reports today about Margaret Thatcher, Ludgate was always ˈlʌd ɡeɪt, never ˈlʌd ɡət (LPD bolded first pronunciation) and ˈlʌd ɡɪt seemed like a wild fantasy. For me cold and called can definitely be homophonously /kɒod/. Also, I used to live in Plaistiw with a northerner, and she always pronounced it with the TRAP vowel, despite everyone around her using a long BATH vowel. This was really informative. There is nothing like pronouncing something incorrectly to make you feel like an idiot.